Have you ever wondered why the artificial versions of real plants got the name "silk plants" when they aren't even made from silk? Many of the historical names of products have stuck over the years even though the material used to manufacture them has changed. Silk plants originally were made from silk material and many factories were producing them at a slow rate. As the plants became more popular in the home decor market, the manufacturers wanted to find a less expensive and more practical way to make these types of plants without sacrificing quality and realism. They found that polyester worked well for the leaves and if they silk screened the details on the fabric they could make the leaves look more realistic than their silk counterparts. Most silk plants are made from this material rather than silk because of the lower cost and more detail that can be added to the look. The "silk plants" name just stuck and with new technology the artificial plants and flowers are looking more lifelike than ever before. 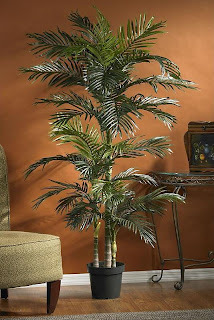 Many artificial trees and plants are still using real wooden trunks and stems to give them the most authentic look possible. Real coconut bark is used on many artificial palm trees to cover up any plastic parts that are used in the plant. On some of the silk banana trees real banana bark is used on some of the higher quality trees to cover the trunk to give it not only a realistic look but also a realistic feel also. Wire is infused in most stems to give you the ability to shape the trees and plants to your liking and also adds to the durability of the plant. Next time you hear the term "silk plants", you can remember that at one time they were made from silk but now they are made mostly from a silk screened polyester.